The Future of Moving & Storage is Here, and It is Mobile! We have three different sizes of weather-tight storage units that can be delivered right to your door – then we load them, or you load them. NOTE: There is a $59 delivery charge to bring you the storage containers and drop them off, and a $59 pickup charge to come out and pick them up when you are done with them. Outside of Eugene/Springfield, there is also a $1.59/round-trip-mile fee for going outside the local area. 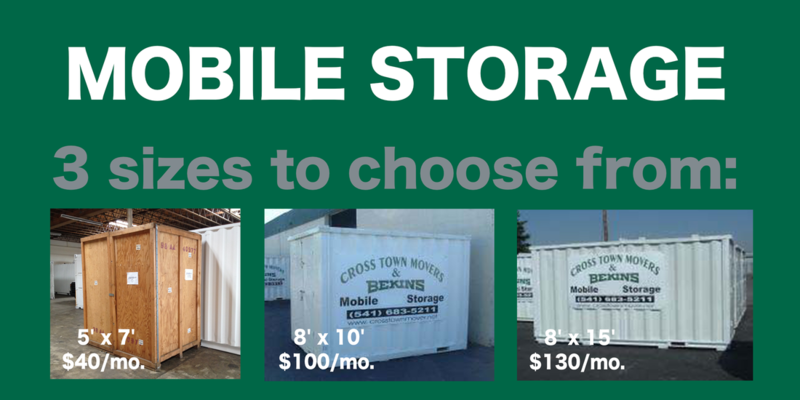 Cross Town Movers offers Mobile Storage. Mobile Storage means we bring the storage unit(s) to you. You can load your goods at your own pace and in the convenience of your own driveway, or our professional staff can load them for you. We pick them back up and then store them for you at our secure facility. You can access your storage units at any time at our Cross Town Moving Center located at 1305 S. Bertelsen Road, in Eugene. Our facility is monitored 24/7 by Tyco Security, using state-of-the-art cameras and sensors. When you're ready for your goods, just give us a call and we'll deliver them back out to you. After you unload (or our staff), then we come and pick up the empty containers. It's that easy! With Mobile Storage units delivered to your door, you won't have to rent a truck and best of all you won't have to handle things twice. Think of all the time you'll save! Our full time professional staff will pad and protect all of your items prior to putting them into storage. We excel at maximizing the space in your unit.